Farber deferred praise, saying that by charging into danger to rescue the victims he "merely put off the fate that befalls us all." "I'm no hero," Farber said after rescuing the family from a house fire on the 2500 block of West Thacker Street, and prolonging for the time being their slow march toward oblivion. "Like any other man, I am thrown into this world, alone and terrified, to play a meaningless role in an empty life. In my case, that role happens to involve charging through towering blazes to pull helpless individuals from a sea of flames before they suffocate or are burnt alive." Added Farber, "That hardly makes me a paragon of virtue." At 2:30 a.m. Monday, the alarm sounded at Farber's station house, causing the despondent firefighter to emerge from a deep malaise and, though still absorbed by the sense of dread that has preoccupied him since youth, respond promptly to the request for assistance at the home of Stanley and Joyce Morgenstern. 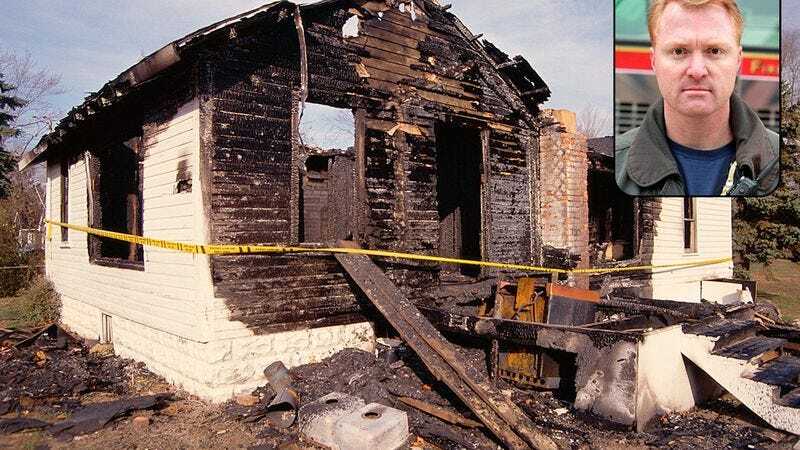 According to department officials, Farber, a 13-year veteran of Ladder Company 8, climbed through a kitchen window and, despite carrying with him a heavy burden of alienation, managed to see all three members of the family to safety. "He came out the front door with a body slung over each shoulder, and seconds later there was this big fireball and beams started falling and the whole thing caved in," neighbor Judy Neal said. "When it was all over, he just sort of stood there emotionless and silent, as if nothing had happened at all." "I think I even saw him shrug," she added. While acknowledging that the Morgenstern family no longer has a home, authorities said it really makes no sense to bemoan this fact, as things like this happen every day, and it's no use trying to pretend that, in and of itself, existence is anything but a provisional circumstance over which we exert limited control. Though the cause of the fire remains unknown, and can perhaps never truly be known, sources close to the investigation said that no foul play is suspected, only the haphazard, amoral processes inherent in nature itself. "The house will be rebuilt, or perhaps it won't," Farber said of the destruction. "Perhaps an entirely new building will be built there, one that's not even a house. Or maybe it will remain a vacant lot, and a tree will grow there, and some day, long after I and everyone I know has died, young children will come here and play in its branches." Farber became a firefighter in 1997, although he stresses that he could just as easily have ended up a baker, an attorney, or a parking garage attendant, depending on whether or not circumstances led him to find himself in such a life. As for the ultimate consequences of his actions Monday, Farber said they will forever remain uncertain. "The family has thanked me repeatedly, especially for saving the life of their only child, but their gratitude ignores the full, crushing weight of reality," said Farber, his brow furrowed. "The world may have all kinds of torture in store for that kid, misery that could have been avoided if not for me." "I tried to explain to them that what I did was really nothing more than an expression of despair, and thus absurd, but they just kept saying 'thank you, oh my God, thank you, thank you so much,'" Farber continued. With local residents applauding the rescue as an inspiring act of bravery, Farber acknowledged to reporters that entering a burning building and knowing you may never come out is indeed a scary thing. But, he argued, it takes far more courage to face down the fear that comes each day from the horrifying and inescapable knowledge that, at any given moment, a man has the complete freedom to simply pour gasoline all over himself, strike a match, and let himself burn. When asked if he felt something, anything, after briefly extending the lives of three human beings, Farber replied in the negative. "I was doing what, at that moment, I was doing," he said. "Tomorrow, if there is another fire, I will do the same. Perhaps in that fire, I will be the one who is killed. Or, on the other hand, perhaps I will not. Either way, there will be anguish and sorrow at some unknown point." Added Farber, "There always is."